Why Vinyl Fencing & Railings are Best in Myrtle Beach? 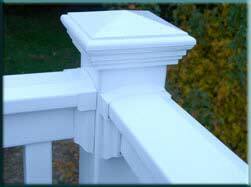 At Carefree Exteriors we use only commercial grade vinyl products. Besides being beautiful and long lasting in the Myrtle Beach southern climate, our products are engineered for strength and durability. They come with a lifetime factory warranty. No matter how good a carpenter is, wood will expand and shrink and warp over time. Wood, and metal, requires painting and replacement in 5 to 10 years. Vinyl does not require painting, does not warp, is fungus and dry rot free, is termite free, and is graffiti resistant. Vinyl is free of harmful chemicals such as arsenic and creosote. The life cycle cost of vinyl is lower than wood or metal. Vinyl fencing, siding, windows, and doors will look like new for many decades.